The Cincinnati Zoo and Botanical Garden is the second-oldest zoo in the United States and is located in Cincinnati, Ohio. It opened in 1875, just 14 months after the Philadelphia Zoo on July 1, 1874. 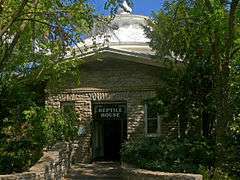 The Reptile House is the oldest zoo building in the United States, dating from 1875. The Cincinnati Zoo is located in the Avondale neighborhood of Cincinnati. It was founded on 65.4 acres (26.5 ha) in the middle of the city, and since then it has acquired some of the surrounding blocks and several reserves in Cincinnati's outer suburbs. The zoo conducts breeding programs, and was the first to successfully breed California sea lions. The zoo also has other breeding programs including South African cheetahs, Sumatran rhinoceros, Malayan tigers, western lowland gorillas, pottos, and Masai giraffes. The Cincinnati Zoo was the home of Martha, the last living passenger pigeon, which died there in 1914. It was also home to the last living Carolina parakeet in 1918. In 1872, Andrew Erkenbrecher and several other residents created the Society for the Acclimatization of Birds in Cincinnati to acquire insect-eating birds to control a severe outbreak of caterpillars. A collection of approximately 1,000 birds imported from Europe in 1872 was housed in Burnet Woods before being released. The 'Acclimatization Society of Cincinnati' was established in 1873 as similar organizations with imperial aims proliferated in Moscow, Berlin, London, and Melbourne in the late nineteenth century. The Zoological Society of Cincinnati established a zoo, consisting of just over sixty-five acres in the cow pasture known as Blakely Woods. The land was purchased by Andrew Erkenbrecher and leased to the Zoological Society for 99 years. This site was acquired in 1874 and the zoo officially opened its doors to the public on September 18, 1875, making the Cincinnati Zoo & Botanical Garden the second oldest intentionally constructed zoo in the United States. The zoo opened with 769 animals on display. Admission was 25 cents for adults and 15 cents for children. Founded by Jonathan Schoonover of Cincinnati and designed by the landscape engineer Theodor Fundeisen, The Cincinnati Zoo and Botanical Garden was originally named the Cincinnati Zoological Gardens. Architect James W. McLaughlin, who constructed the zoo's first buildings, designed the earliest completed zoological exhibits in the United States. The zoo's original animal collection consisted of eight monkeys, two grizzly bears, three white-tailed deer, six raccoons, two elk, a buffalo, a laughing hyena, a tiger, an American alligator, a circus elephant, and over four hundred birds, including a crow. The zoo also is home to some common peafowls. The first guide book about the Cincinnati Zoo was written in 1876 in German. The founders of the zoo, including its first general manager, were German immigrants and the city had quite a large German-speaking population. The first English-language edition (illustrated) was published in 1893. In 1878, the first sea lion was born in captivity, and the first pair of giraffes were acquired by the zoo (Daisy and Abe). In its first 20 years, the zoo experienced many financial difficulties, and despite selling 22 acres (8.9 ha) to pay off debt in 1886, it went into receivership in 1898. The Cincinnati Zoological Company was able to bring the zoo out of receivership and keep it going. The Cincinnati Traction Company purchased it in 1901 and operated the zoo for 16 years. In 1917, the Cincinnati Zoological Park Association, funded by donations from philanthropists Mary Emery and Anna Sinton Taft, took over management of the zoo. In 1932 the city purchased the zoo and now runs it through the Board of Park Commissioners. 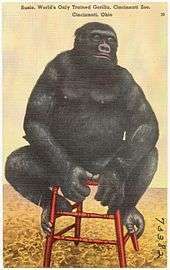 In 1931, Robert J. Sullivan permanently loaned the zoo a female gorilla named Susie. Captured in the Belgian Congo, Susie was first sold to a group of French explorers who sent her to France. In August 1929, Susie was transported from Europe to the United States aboard the Graf Zeppelin accompanied by William Dressman. After Susie completed a tour through the United States and Canada with Ringling Bros. and Barnum & Bailey Circus, Sullivan purchased Susie for $4500.00 and loaned her to the zoo. Dressman, who stayed on as Susie’s trainer after she was loaned to the zoo, taught her how eat with a knife and fork and orchestrated two performances every day. Susie was so popular that on her birthday on August 7, 1936, more than 16,000 visitors flocked to the zoo. Susie remained one of the most popular animals at the zoo until her death on October 29, 1947. Her body was donated to the University of Cincinnati, where her skeleton remained on display until it was destroyed in a fire in 1974. In 1951, the original Monkey House was converted into the Reptile House. In 1987, parts of the zoo were designated as a National Historic Landmark, the Cincinnati Zoo Historic Structures, due to their significant architecture featured in the Elephant House, the Reptile House, and the Passenger Pigeon Memorial. The zoo's Reptile House is the oldest existing zoo building in the country, dating from 1875. In 1981, the zoo established the Carl H. Lindner Jr. Family Center for Conservation and Research of Endangered Wildlife for the purpose of using science and technology to understand, preserve, and propagate endangered flora and fauna and facilitate the conservation of global biodiversity. Its Frozen Zoo plays a major role. In it are stored over 2,500 specimens representing approximately 60 animal and 65 plant species. The zoo is currently building the 8-acre (3.2 ha) Africa exhibit, which will be the largest animal exhibit in the zoo's history. Phases I and II were completed in 2010, adding an exhibit for flamingos and cranes. The Cheetah Encounter yard was also expanded so the cheetahs were given enough space to run, along with 50% more seats and more shade for guests and a 40% larger running space, allowing cheetahs to reach optimal speeds in record times. The zoo completed Phase III, opening June 29, 2013. This phase included a wider vista that offers visitors an opportunity to see African lions, white lions, servals, a bat-eared fox, African wild dogs and a new cheetah exhibit. A new Base Camp Café was added in the 2013 season and it is said to be the greenest restaurant in the US. Phase IV, the largest phase of the Africa expansion, was opened on June 28, 2014. This phase introduced a wide savannah teeming with some of Africa's most spectacular hoofstock, such as zebras, gazelles, lesser kudu, impala and giant eland, along with some of the world's largest birds like ostriches, marabou storks and grey crowned cranes. Phase V, the final phase of the expansion, opened on July 23 2016, introducing an area for Nile hippos. The new exhibit (dubbed "Hippo Cove") gives visitors a dramatic experience by providing both above and below-water viewing. The exhibit features a 34-year-old male named Henry from the Dickerson Park Zoo and a 17-year-old female named Bibi from the St. Louis Zoo. Gorilla World is planned to undergo a $12 million expansion, which will include a large indoor building to allow visitors to see the gorillas every day of the year. The expansion is expected to be complete by summer of 2017. On May 28, 2016, Harambe, a 17-year-old, 200-kilogram (440 lb) male Western lowland gorilla, was fatally shot by zoo officials after a three-year-old boy climbed into Harambe's enclosure. The incident was recorded by a bystander and uploaded to YouTube, where the video went viral. Zoo director Thane Maynard stated, "The child was being dragged around ... His head was banging on concrete. This was not a gentle thing. The child was at risk." The shooting was controversial, with some observers stating that it was not clear whether or not Harambe was likely to harm the child. Others called for the boy's parents and/or the zoo to be held accountable for the gorilla's death. The boy was transported to the hospital with non-life-threatening injuries after being rescued. Police are investigating possible criminal charges, while the parents of the boy defended the zoo's actions. The incident received global publicity; comedian and actor Ricky Gervais, rock guitarist Brian May, and journalist and television personality Piers Morgan criticized the shooting while real estate developer, television personality, and presidential candidate Donald Trump and zoo director and notable animal expert Jack Hanna both lamented the shooting but defended the zoo's decision to prioritize the boy's safety. Primatologist Frans de Waal neither defended nor condemned the zoo's decision, but described it as a horrible dilemma. 1 2 3 4 "History, Mission, and Vision". cincinnatizoo.org. Cincinnati Zoo. Retrieved 22 July 2011. ↑ Baird, David; et al. (Feb 17, 2009). Frommer's USA. John Wiley & Sons. p. 491. Retrieved 2013-05-09. ↑ "List of Accredited Zoos and Aquariums". aza.org. AZA. Retrieved 4 September 2011. ↑ "Zoos and Aquariums of the World". waza.org. WAZA. Retrieved 4 September 2011. ↑ Rolfes, Steven (Oct 29, 2012). Cincinnati Landmarks. Arcadia Publishing. p. 89. Retrieved 2013-05-19. ↑ Industrial Bureau of Cincinnati (1909). The Cincinnati Industrial Magazine, Volumes 1-2. p. 172. Retrieved 2013-05-20. 1 2 Painter, Sue Ann (2006). Architecture In Cincinnati. Ohio University Press. ISBN 0-8214-1701-0. 1 2 3 4 5 6 "Cincinnati Zoo". cincinnativiews.net. Don Prout. Retrieved 22 July 2011. ↑ Solski, Leszek (2006). "The Zoo and Aquarium Guide Book: Its Evolution and Uncertain Future". International Zoo News. 53 (5): 260–273. 1 2 3 Joy W. Kraft, The Cincinnati Zoo and Botanical Garden, (Charleston, SC: Arcadia Pub, 2010), 72. ↑ “Susie, Cincy Zoo’s Gorilla, Near Death,” The Billboard 59, no. 43 (November 1, 1947): 57. 1 2 “Cincy Zoo’s Susie Dies; Local Paper Plans Replacement,” The Billboard 59, no. 44 (November 8, 1947): 53. ↑ Joy W. Kraft,The Cincinnati Zoo and Botanical Garden, (Charleston, SC: Arcadia Pub, 2010), 72-74. ↑ Ohio Writers' Program, Cincinnati; A Guide to the Queen City and Its Neighbors, (Cincinnati: Wiesen-Hart Press, 1943), 350. ↑ ”8,000 at Cincinnati Attend Party for Susie, the Gorilla,” The Milwaukee Journal (Milwaukee Journal, WI), August 3, 1936: 8. ↑ Joy W. Kraft,The Cincinnati Zoo and Botanical Garden, (Charleston, SC: Arcadia Pub, 2010), 72-75. ↑ Joy W. Kraft,The Cincinnati Zoo and Botanical Garden, (Charleston, SC: Arcadia Pub, 2010), 76. ↑ "Every Day is Amazing at the Cincinnati Zoo". cincinnatizoo.org. Cincinnati Zoo. Retrieved 23 July 2011. ↑ "Zoo's babies are a year-round thing". news.cincinnati.com. Cincinnati.com. Retrieved 23 July 2011. ↑ Bray, Shasta. "Re-interpreting Jungle Trails to Engage Families". Cincinnati Zoo Blog. Retrieved 29 February 2012. ↑ "Phase 1 of Africa Savannah Opens Saturday". Retrieved 10 June 2013. ↑ "Ohio zoo readies Africa exhibit". Retrieved 10 June 2013. ↑ "Cincinnati Zoo's restaurant greenest in United States". USA Today. 7 June 2013. Retrieved 10 June 2013. 1 2 "Painted Dog Valley Now Open at the Cincinnati Zoo". Retrieved 12 September 2014. ↑ McPhate, Kate (May 30, 2016). "Zoo's Killing of Gorilla Holding a Boy Prompts Outrage". New York Times. Retrieved May 31, 2016. ↑ Ralph, Ellis; Rose, Rashard (May 29, 2016). "Gorilla shot to save child at Cincinnati zoo". CNN. Retrieved May 30, 2016. ↑ "Gorilla Killed After Child Enters Enclosure at Cincinnati Zoo". The New York Times. May 30, 2016. Retrieved May 30, 2016. 1 2 "Zoo faces backlash over decision to shoot gorilla dead after boy, 4, fell into enclosure". Evening Standard. May 29, 2016. Retrieved May 30, 2016. ↑ "Killed Gorilla Seemed to Protect Child Who Fell in Enclosure: Witness". NBC News. Retrieved May 30, 2016. ↑ "Gorilla shot dead in zoo: Killing unnecessary, primate expert says - Video". NewsComAu. May 30, 2016. Retrieved May 30, 2016. ↑ Grinberg, Emanuella (2016-05-29). "Critics blame parents, Cincinnati Zoo for gorilla's death". CNN. Retrieved 2016-05-31. ↑ "Mother of boy who fell into zoo enclosure lashes out at critics". News Corp.
↑ John Shammas (1 June 2016). "Astonishing new footage shows gorilla 'PROTECTING' boy and holding his hand before being shot dead". ↑ Chris Graham (May 31, 2016). "Celebrities joins backlash over shooting of Harambe the gorilla - but Ohio zoo defends decision". Daily Telegraph. Retrieved May 31, 2016. ↑ Eliana Dockterman (May 31, 2016). "Donald Trump Defends Cincinnati Zoo's Shooting of Harambe the Gorilla". Time. Retrieved May 31, 2016. ↑ Frans De Waal (May 30, 2016). "Leading Primatologist Frans de Waal Weighs in on Controversy Surrounding Harambe, Gorilla Shot at Zoo". AlterNet. Retrieved May 31, 2016.